Extremely fast curing 2-part epoxy adhesive that can be shaped by hand and sets hard. Perfect for repairing copper pipes and parts. 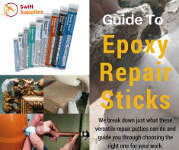 Copper filled epoxy putty that is very simple to use with no complex mixing. NSF approved for use in drinking water applications (ideal for sealing and patching pipes). Weicon Copper Repair Stick is the perfect solution for making fast, lasting and non-rusting repairs to copper pipes, parts and components. This epoxy putty is manufactured in Germany from epoxy resin filled with fillers and has a copper coloured appearance once its cured. Like the rest of our Weicon Repair Stick Range, Copper Repair Sticks are dead simple to use and require no complex mixing. Just cut off the amount you want, knead it in your hands and apply. Copper Repair Sticks bond well to a variety of materials, surfaces and substrates. These obviously include copper but, in addition, high compatibility is also achieved with a wide range of metals (including aluminium, cast iron, brass and stainless steel) and is also used on hard plastics, fibre reinforced materials, wood, derived timber products, glass, ceramics and stone. It is not suggested for use on rubber materials. Weicon Copper Repair Stick has been tested and certified in accordance with NSF for use in and around drinking water and food processing systems. It will tolerate some slight wetness or dampness in the application area and is very fast curing (pot life 3 minutes, handling strength after just 10 minutes). Hot and cold water pipe repairs and sealing. Repairs and patching of holes in pipe bends and fittings. Repairs to worn or rusted copper gutters or sheets. Water heater repair and hole filling. Water tank and hot water system and line repairs. Heating, ventilation and air conditioning system repair and installation. Yes, once it is 100% cured. All of our Weicon Repair Sticks can be painted. That’s fine. Just make sure you only mix the amount you need. Pot life doesn’t start until the two components are mixed which is why you need to cut off and knead just the amount you are going to use. It is suggested that any remains have their little foil cover put back over the end, be placed back in their tube, and be kept in the fridge if at all possible as this will extended the useful life of the product. How hard is it once it’s set? There’s no easy way to answer this as hard is a little subjective. Let’s just say very, like copper actually. The attached technical data sheet on our Weicon Copper Repair stick gives more specifics of course.